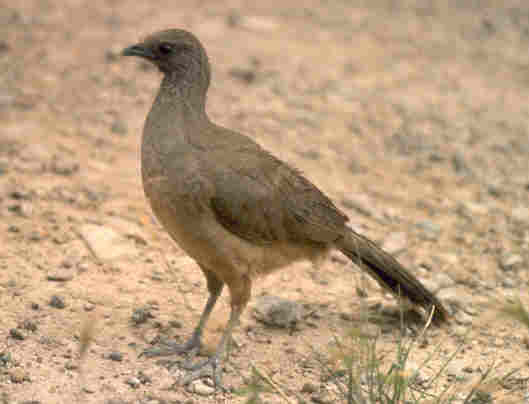 The Plain Chachalaca (Ortalis vetula) typically occurs in small groups of 3-5 individuals in tall, thorny thickets, scrubland, and second-growth forest edge along the Gulf-Caribbean slope from the Lower Rio Grande Valley of Texas and Nuevo Leon, Mexico south to Honduras and Costa Rica. This native, non-migratory gamebird is similar in size and form to a female Ring-necked Pheasant (Phasianus colchicus) and is named for the raucous, ear-splitting chorus a flock makes. The loud cha-cha-lac-a call is most commonly heard during the morning hours, and increases considerably during the February-March breeding season. Unlike most other galliform birds, the brownish-olive Chachalaca prefers to spend much of its time in the trees, earning it the nickname of Mexican Tree Pheasant and allowing it to thrive in tangled brushland resulting from logging or other mechanical habitat manipulation. Chachalaca prefer to run along larger limbs through the treetops or scurry through interior branches while feeding on leaves, berries, and seeds. Birds feed in loose flocks of 4-6 in number and tend to select the ripest fruits available, therefore they are often observed feeding in precarious positions, including upside-down. Chachalaca do not scratch on the ground for food, however they will seek out insects and invertebrates when encountered. Feeding activities are generally concentrated near native food sources. Chachalaca also readily consume feed supplied by humans-preferring cracked corn and milo. Flight is heavy and rarely sustained, but brief bursts can be swift and silent. Plain Chachalaca hens typically lay 3 eggs in flimsy-appearing nests constructed on tree limb forks. Like other galliform species, re-nesting is common if initial nests or broods are destroyed. The precocial young are able to cling to tree branches as soon as they dry and can fly short distances within a week of hatching. Adult birds commonly live 5- 8 years in the wild. Although market hunters pursued Plain Chachalaca historically, most direct exploitation today is by subsistence hunting in undeveloped countries of Central America. Continued deforestation and human encroachment in these areas have destroyed and fragmented habitats, rendering isolated populations vulnerable. Indirect exploitation also exists throughout the species Texas range as a by-product of habitat conversion to agricultural/residential uses. However, efforts to re-establish viable populations in suitable habitat within historic ranges have proven very successful. Current range of the Chachalaca is limited to Cameron, Hidalgo, Starr, and Willacy counties in the Rio Grande Valley. Secretive and often difficult to spot in their native habitat, this unique gamebird offers a challenging hunting experience for the outdoorsman. Legal hunting seasons begin in early November and extend through mid-February. The daily bag limit is 5 birds. Texas Parks & Wildlife offers hunting and viewing opportunities for Plain Chachalaca at a variety of State-owned facilities in the Rio Grande Valley. Hunter access is allowed on 5 units of the Las Palomas Wildlife Management Area. These include the Baird, Anacua, Carricitos, Longoria, and Tucker Units of LPWMA. Public access viewing sites include the Boca Chica, Longoria, and Penitas Units of LPWMA as well as Bentsen-Rio Grande and Falcon State Parks, and at World Birding Center viewing sites Resaca de la Palma and Llano Grande State Parks. A valid hunting license, all applicable stamps, and a $40 Annual Public Hunting Permit is required prior to engaging in hunting activity.